Material History, the second exhibition at JDJ, features the work of Yuji Agematsu, Charles Harlan, and Nari Ward. All three artists use humble materials—everyday objects that have been found or discarded, and bits of life’s detritus—recontextualized by each artist in their own way. The unifying theme is a sense of understanding that our identities are shaped and defined by the accumulation of objects that surround us, and that they can communicate a tremendous amount about our existence. On his daily walks through New York City, where he has lived since 1980, Yuji Agematsu (b. 1956 Kanagawa, Japan) stops to collect scraps of litter he encounters along the way, transforming the overlooked, the forgotten, the abandoned into contemplative but joyous visual poetry. The two tables on view here, originally presented in his exhibition at Yale Union in Portland, Oregon, demonstrate how, when laid out delicately against a pristine white surface, cupcake wrappers can be transformed into floral blooms, and pavement marking tape can look like a delicate piece of shed snakeskin. 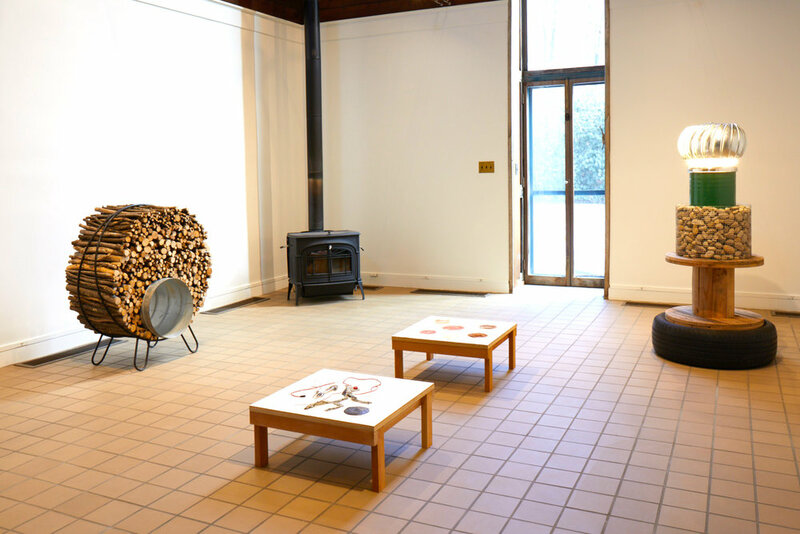 Agematsu’s work is currently on view in the 57th Carnegie International at the Carnegie Museum of Art. Charles Harlan (b. 1984, Smyrna, GA) creates sculptures often using wood and common materials that could be found in a hardware store, which he then stacks and arranges into austere formations. Turbine, 2018, is a meditation on opposing forces—the earth and the sky, darkness and light, the softness of rubber and the hardness of stone. 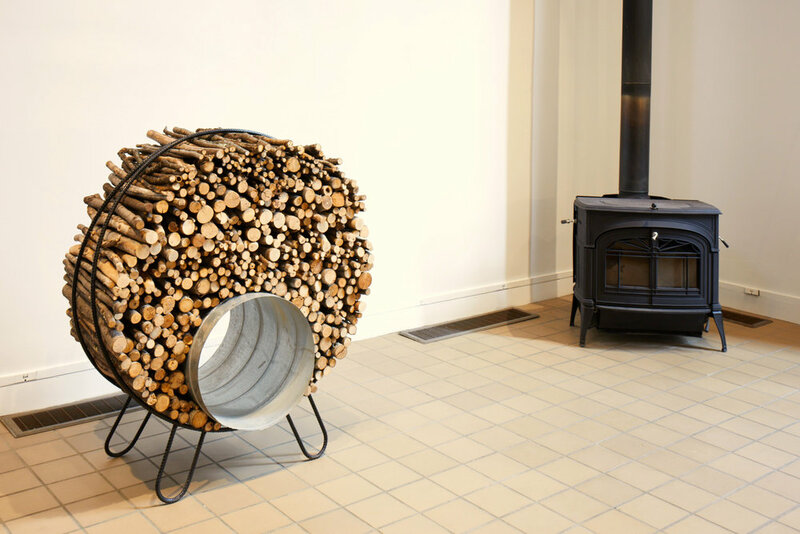 With Sticks, 2018, Harlan packs a circular metal form with sticks and a segment from a large pipe, the collection of cylindrical shapes echoing one another. The sculptures are materially evocative of the exhibition site, a former service building used to store ice, but feel formally related to Minimalism. Using an accumulation of discarded objects, often from Harlem where he has lived and worked for the last 25 years, Nari Ward (b. 1963, Saint Andrew, Jamaica) explores themes related to the socio-economic conditions of his surrounding community. 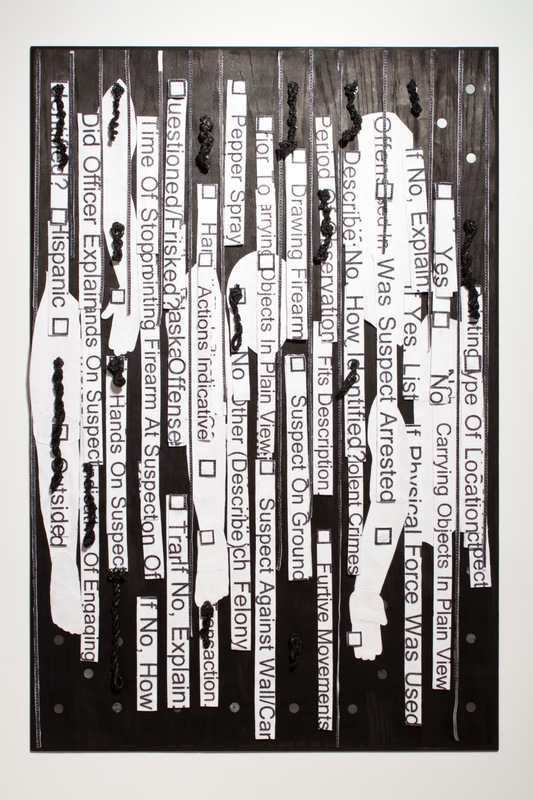 In Susect on Ground, 2012, Ward repurposes text from a stop-and-frisk form used by the New York City police department and reprints it at human scale on strips of fleece, calling attention to the lacxk of humanity in its language. Ward’s first solo survey exhibition in New York will open at the New Museum in February 2019.